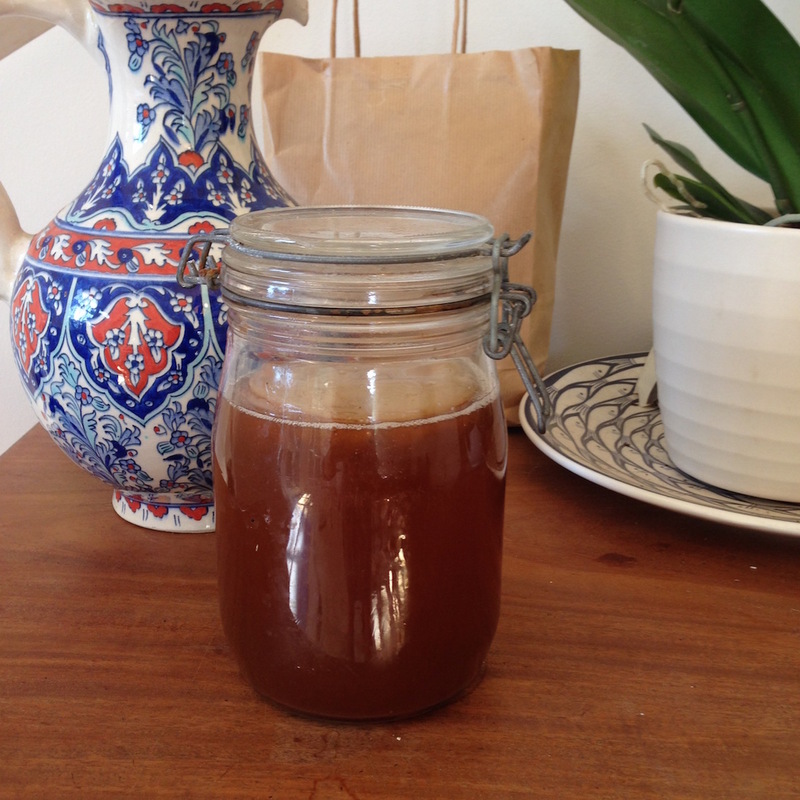 Jess grew me a SCOBY – see here – so I have started making kombucha – a fermented tea drink. So far I have just made one version (a raspberry one) – with another (blackcurrant) on the way. 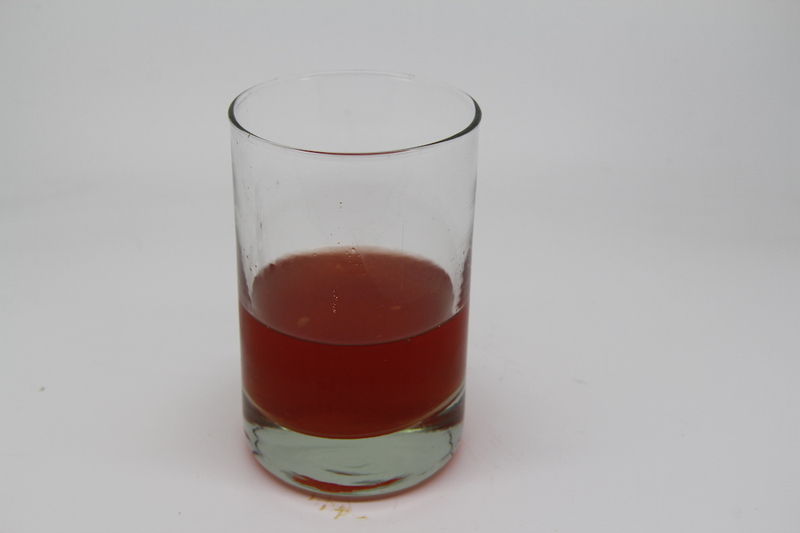 First Ferment: make a litre of tea – I make green or white tea, but you can make black tea. Add about 1/3 cup of sugar to it. Let it cool completely then put in a jar with the scoby and about 1/2-1 cup of kombucha from previous ferment. Cover with a cloth – don’t make it airtight and leave for 7-10 days until it tastes sharp enough for you. 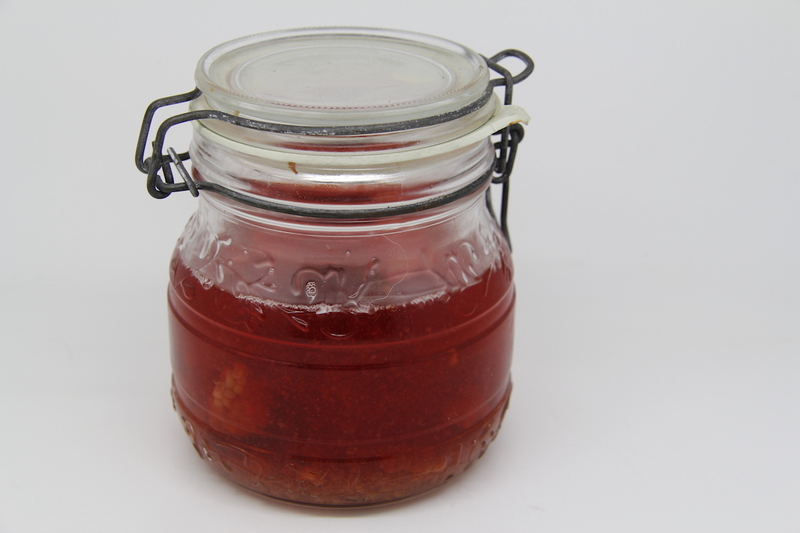 Second Ferment: Pour out kombucha into a botle or jar, leaving 1 cup with the scoby for the next ferment. Add in fruit or flavourings. Seal it and leave for three days, then refrigerate and drink! My first batch was a little sharp so I think I will either add more sugar next time or do the first ferment for fewer days. Because it was a little sharp I drank it with fizzy water and it was lovely. I will let you know how future batches turn out. N.B. of course it is ridiculously good for you! Very cool place you have! Claire, I’m pretty sure its not the placebo effect. I’ve experienced much health improvements when nothing else worked, and know many who have as well. Especially for folks like us with inflammatory bowel/immune problems and cancer and digestive and skin issues. My friend is a nutrition biochemist at the local U of MN and he’s very interested in it as well!! Maybe a study coming up from a very reputable lab….AND the paper is fine over the top of the jar, just secure it with a rubber band or something so bugs can’t get in yet it breathes. So a coffee filter, hand towel, paper towel all work!! I’d also say branch out and get a big jar so you can start drinking this daily. That’s usually the prescription! a large glass daily. SOOOO many options for flavors. I will often make simple syrups from fruits and add a few ounces to each 2F bottles and then let it sit for a few days. ( That’s the second ferment sign..).I’ve tried to make Elder Flower from dried flowers but it was awful (sad face, sniff) I’ve used herbs in a few 2 F bottles, like lavender flower, rose petals, rose hips, hibiscus, or just chunks of fresh fruits. I’m not much of a ginger fan so haven’t tried it yet but many folks love it in chunks into the 2F bottles. I really like fresh mint in 2F and then when I’m ready to drink it I add fresh lime to the mint drink. Basically to get a good fizz it needs a bit of sugar in some form be it natural, organic or not. Just NOT HONEY. Unless its fresh honey added right as you are drinking it. Do not put in first ferment (1F) or 2F. As we say in Iowa, “Go Hog Wild” and let your imagination take it away…. Thanks for the idea about mint – it sounds lovely. I will also add in some extra sugar to try and get the elusive fizz! Also, if you are so inclined, on Facebook there is a private group of International Kombucha brewers. Called Kombucha Nation. We do nothing but discuss fermented foods/drinks and share ideas. its a VERY helpful page and I’d suggest it if you’d like lots of up to date, easy to access info with lots of feedback from long term brewers. I’m on it along with a few family members and friends who are all now brewing thanks to me!! SHARE THE SCOBY!! Looks like I might have to join Facebook! I know….but its in the name of SCIENCE! so its ok then! Then we could go mad on kombucha discussions together! The more the merrier! so much to know and learn. We used to make that in the 70′ !! !